Born and raised in San Francisco, Peter grew up playing music in the parks and the beaches with a variety of great players. San Francisco was the place to be in the late 60's, and Peter was right there when the latin sound was breaking into the mainstream. 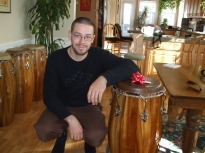 He became a wood worker early in his life, and always dreamed that some day he would build his own fine congas. 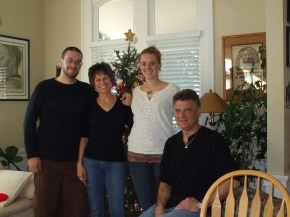 Peter is a carpenter and fine-trim wood worker and has enjoyed many years of building spectacular homes in the bay area. Photos of some of his work have appeared in such publications as Fine Homebuilding, Sunset Magazine, Architectural Digest, and others. He is a licensed contractor, member of the Petaluma Arts Council, avid free-diver, and past Governor of the Petaluma Moose Lodge. Call Peter at his shop in California 707/738-2762 or send a contact form off this website. Check out YouTube for live videos to hear some of the congas being played. Peter lives in Petaluma with his wife, Linda. They have two children, Aaron Haggerty (a professional drummer who tours with Al McKay's LA All Stars, the Earth, Wind, and Fire Experience) and Melissa Musser (dancer and a manager of a dance clothes shop in San Rafael). Aaron with his own PM Percussion conga. Aaron enjoys the sound of Peter's drums and has his own custom-built conga. 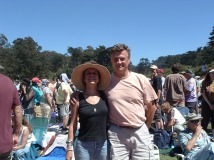 Enjoying the music and sun with the crowd of tens of thousands who met in San Francisco to celebrate the 40th anniversary of the Summer of Love. Aaron played in one of the bands with guitarist (his uncle) Terry Haggerty.